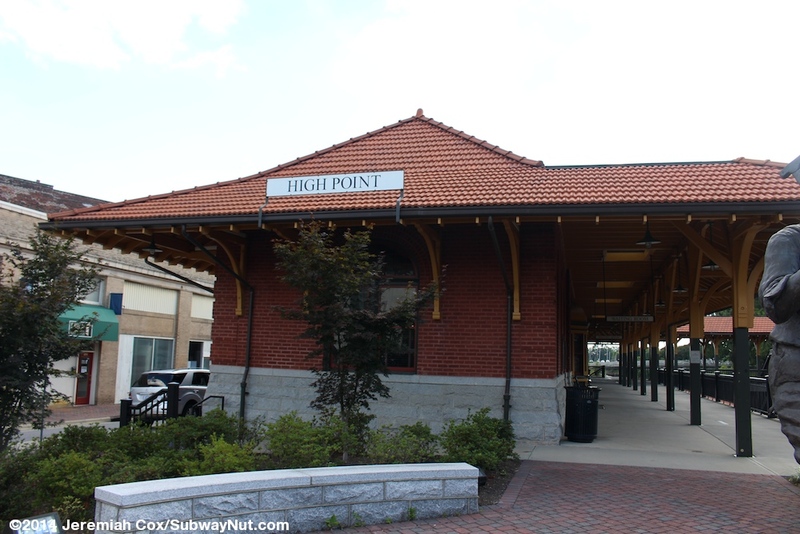 High Point is the other stop in the Piedmont Triad with Greensboro, the other station of the 3 cities served directly by train. The third is Winston-Salem and this station also provides access to Winston-Salem from the NC Amtrak Connector. This bus is PART (the regional bus authority) Route 5 that makes 3 round-trips per day directly to and from Winston-Salem. 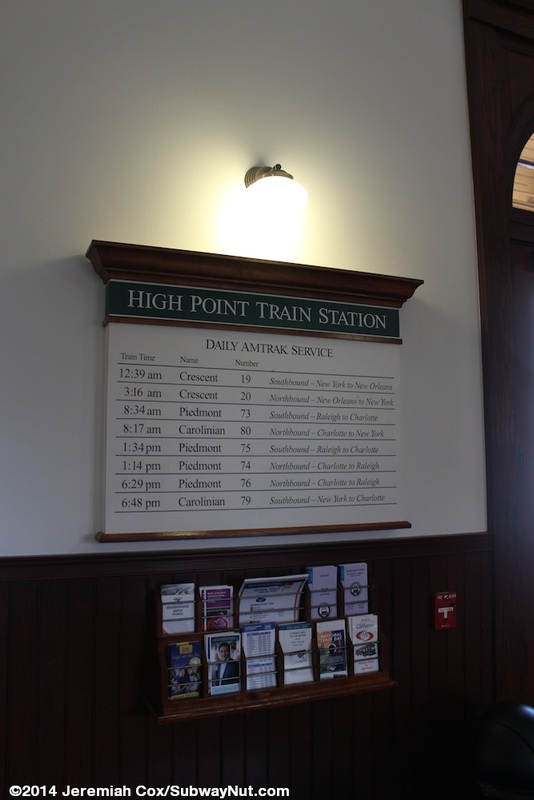 The current schedule of 3 Piedmont/Carolinian round-trips stopping per day has trains scheduled to pass each other between High Point and Greensboro. 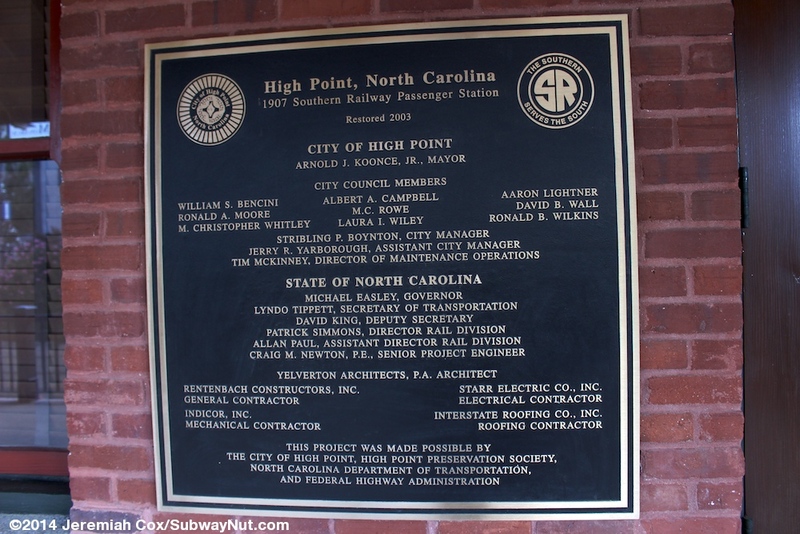 This means trains in each direction are scheduled to stop in High Point within 20 minutes of each other. 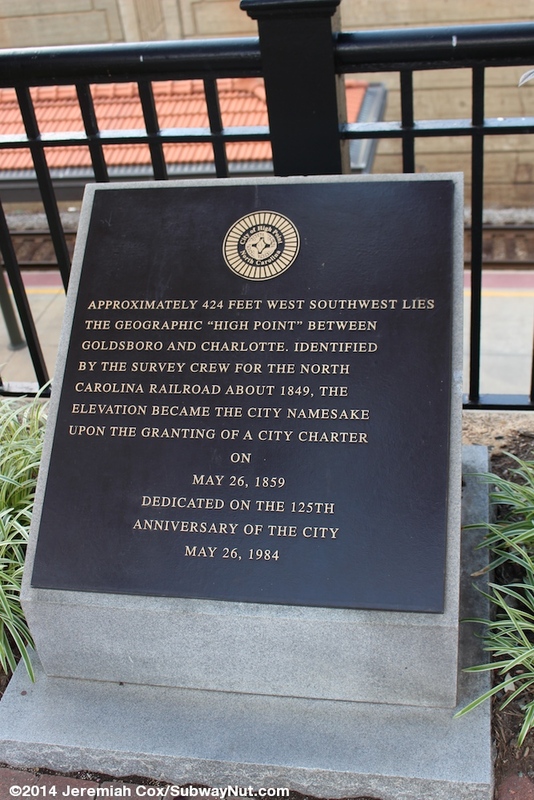 This means each of the three bus trips connects with trains in both directions, arriving in time to connect with the earlier Raleigh/New York-bound Train and departing in time to receive passengers from the later Charlotte-bound Train. The city bus will also wait up to 90 minutes for a late running train. No connecting service is provided to the Crescent that stops in the middle of the night. The NC Amtrak Connector supplements regularly scheduled PART regional bus service on route 3 that runs weekdays hourly or better (only 6:00am and 7:00pm) between High Point and the PART Regional Hub where buses pulse with connections to Greensboro and Winston-Salem. PART does advertise the fact the NC Amtrak Connector bus is open to all and not just connecting train passengers. I'm sure on Weekends when the regular regional buses don't run it has its regulars as the only link between Winston-Salem and High Point. The NC Amtrak Connector also has a strange Amtrak ticketing anomaly. The bus only accepts cash (or PART fare cards) paying the regular $2.40 PART fare. 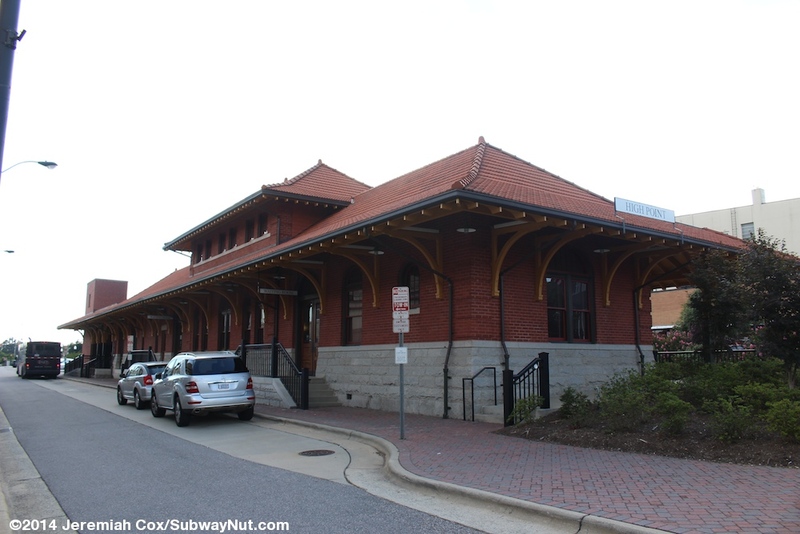 Passengers can purchase tickets to Winston-Salem directly through Amtrak (Station codes WNS for the Downtown Transit Center, UWS for the State University, both stops) and are charged nothing on top of the regular fare to High Point. They are required to get paper value tickets (no eTickets) for their entire journey. The ticket for the RSVD Thurway has no listed value and instead there is just a note in the Endorsements/Restrictions to read: "NC Amtrak Connector Thurway -- Not Valid for Passage each PSGR Must Pay $2.40 Fare Directly to Bus Driver — No Vld for Local Travel. Refund Fee May Apply." This ticket is meaningless and just tells you to have the $2.40 fare in exact change to use the throughway bus. 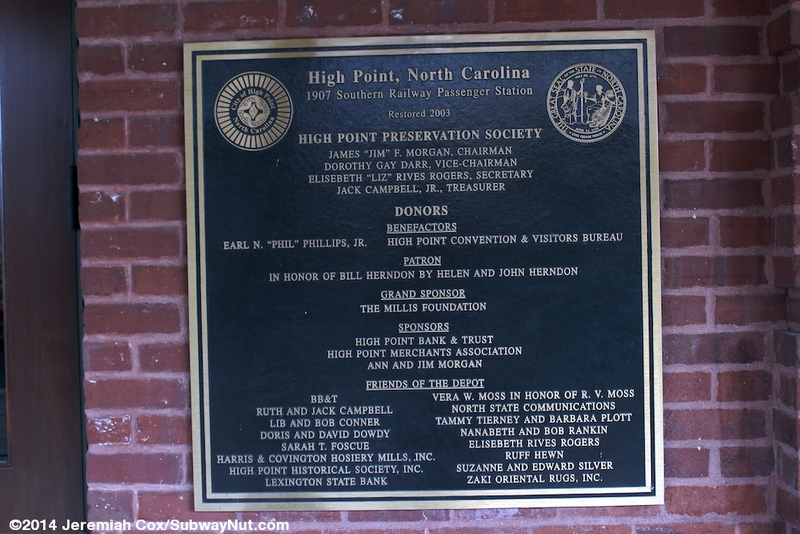 The High Point Station itself has always been a stop on the Crescent (although a flag stop in some years) and its processors since the brick and stone Richardson Romanesque Station house was built in 1907. 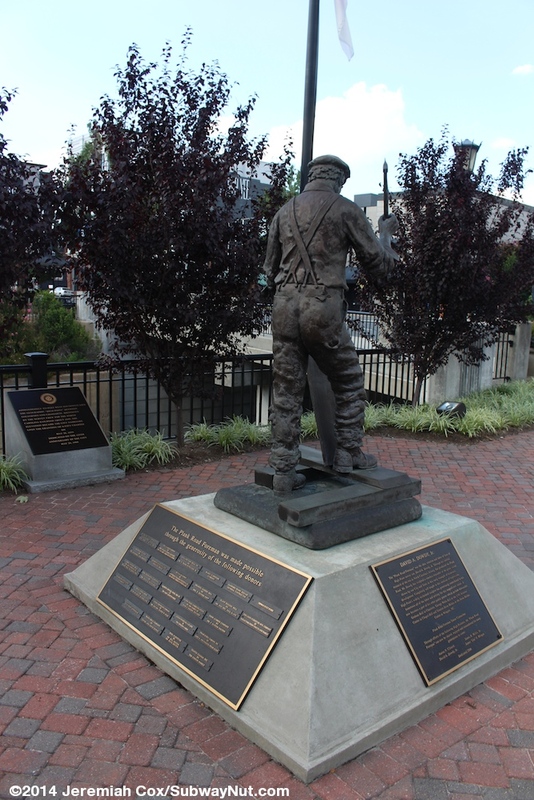 In the 1930s a one-mile trench was built through downtown High Point grade-separating trains and requiring passengers to go down stairs (or via a freight elevator) from street level to the new sunken below-grade platform. The station was most recently renovated and restored in 2003. For the phase of the project while the platform was being modernized and rebuilt along with the installation of a new glass elevator shaft. The station was closed from March 28, 2003 until December 9, 2003 when train service was restored and the station rededicated. 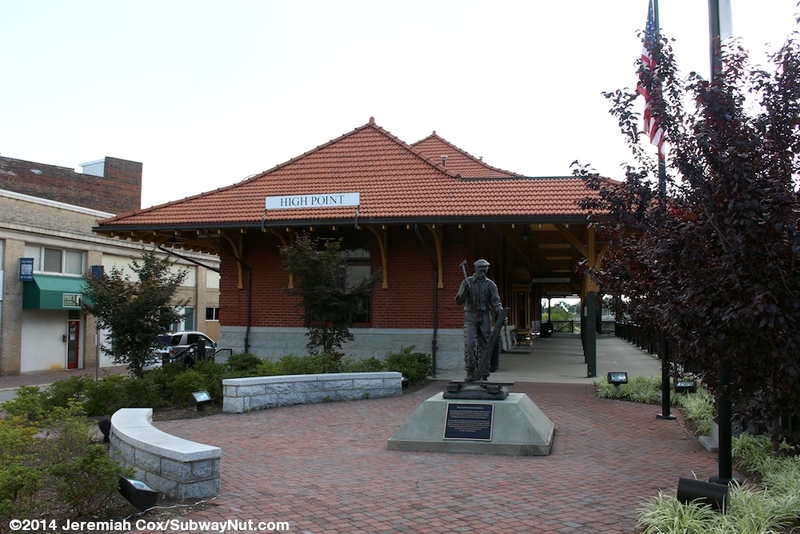 For these months the only station in the Piedmont Triad was the original Greensboro Station located out of town in a freight building a bit closer to High Point than the current station. Greensboro was also the original connecting point for throughway service to Winston-Salem. 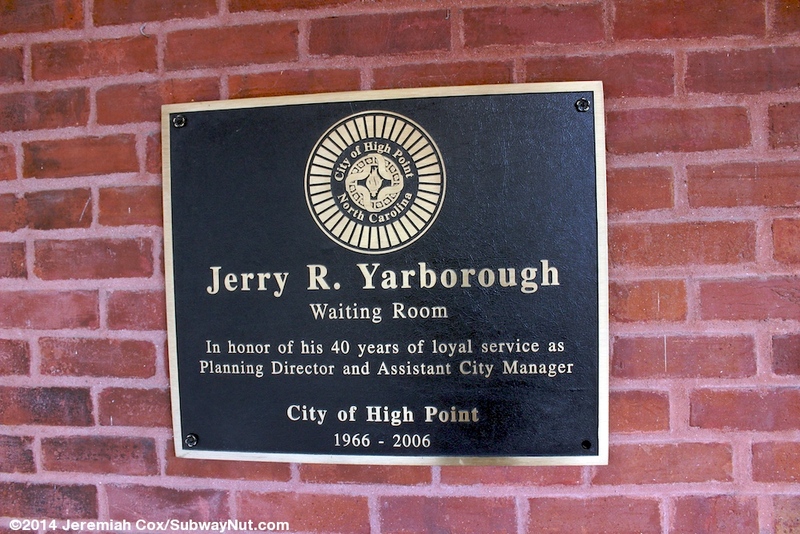 It switched to High Point shortly after the station was rededicated. 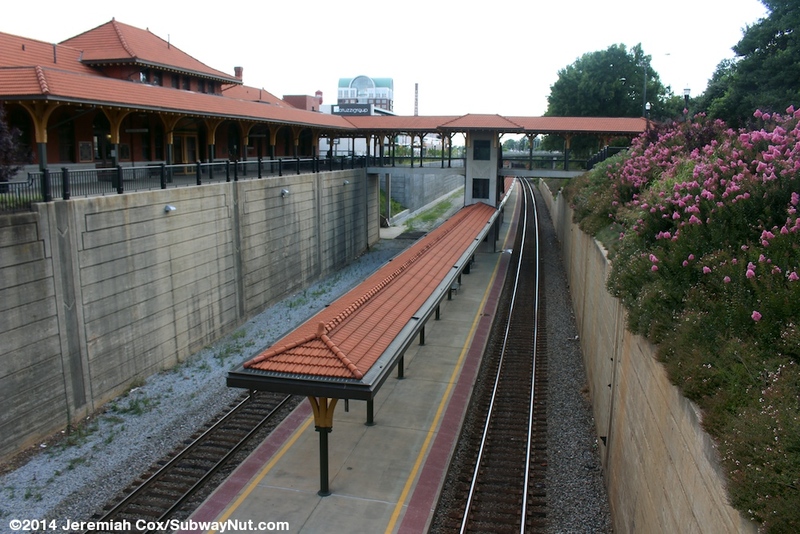 The Winston-Salem Connector first began running in 1994, shortly after the Carolinian began running in 1990. It has never connected to the Crescent. 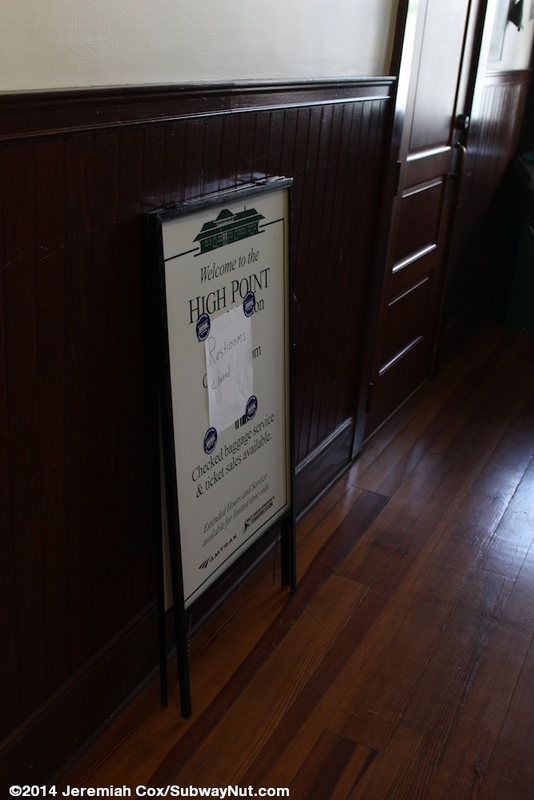 At some point shortly after the renovations in around 2004 — never included in any timetables, there is an old sign sitting in the station – the stop was briefly staffed by an Amtrak Agent and checked baggage service was offered using the baggage elevator that was restored. Ridership at the stop is too low to warrant dedicated Amtrak staff. Today the station is just staffed by an NC Station Host who helps people purchase tickets at the QuikTrak machine. The station has an access-controlled platform. A NC Station host opens the station around every train departure. 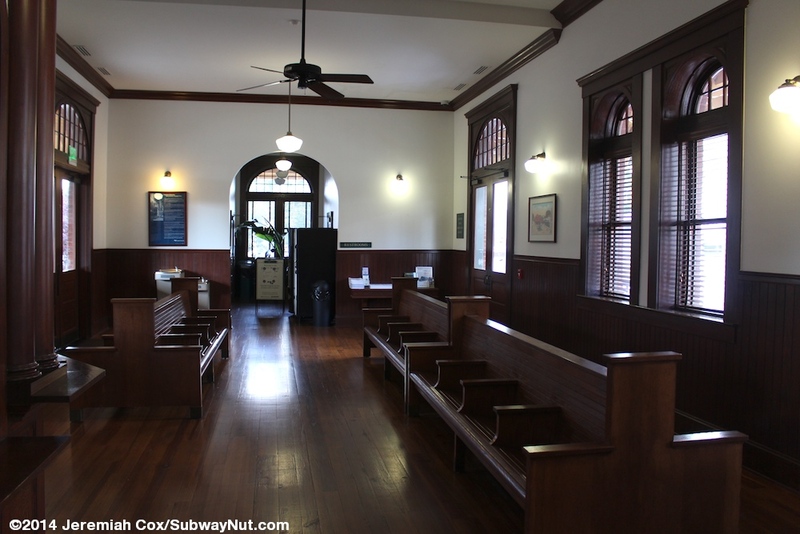 The host requires all passengers to show tickets and the elevator and staircase down to the platform are kept behind a locked gate or off until trains are in the proximity of the station when a boarding call is made (the station does have a functioning PA system). 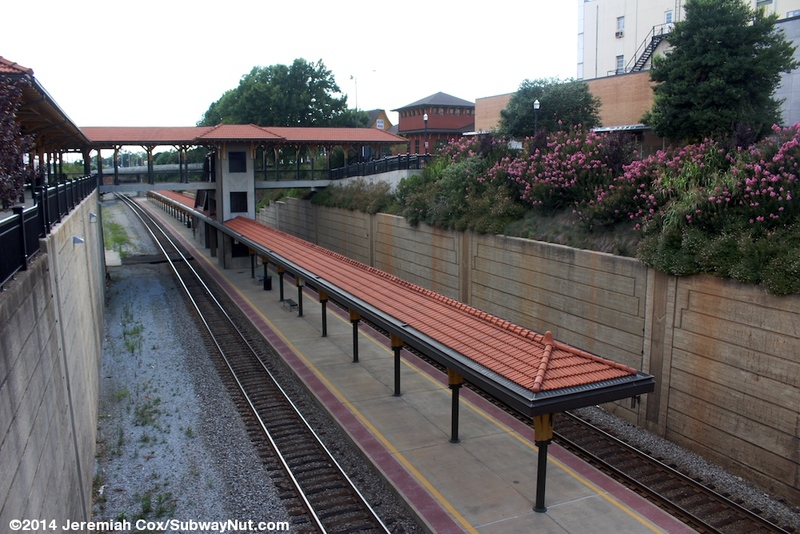 The platform is 750 foot long and runs nearly exactly between the overpasses across the open-cut of Main Street (NE-end) and Elm Street (SW-end). 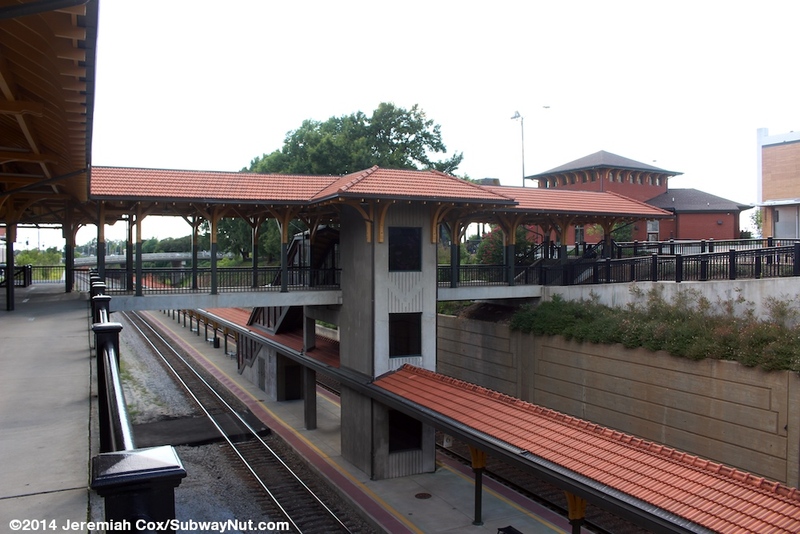 Nearly the entire length of the platform is covered by a modern but in the same style as the historic station canopy structure with green lower posts splitting into ornate orange upper posts, holding up a canopy with a Spanish tile roof just like the rest of the station. All legal passenger access is from a pedestrian overpass just NE of the middle of the platform. 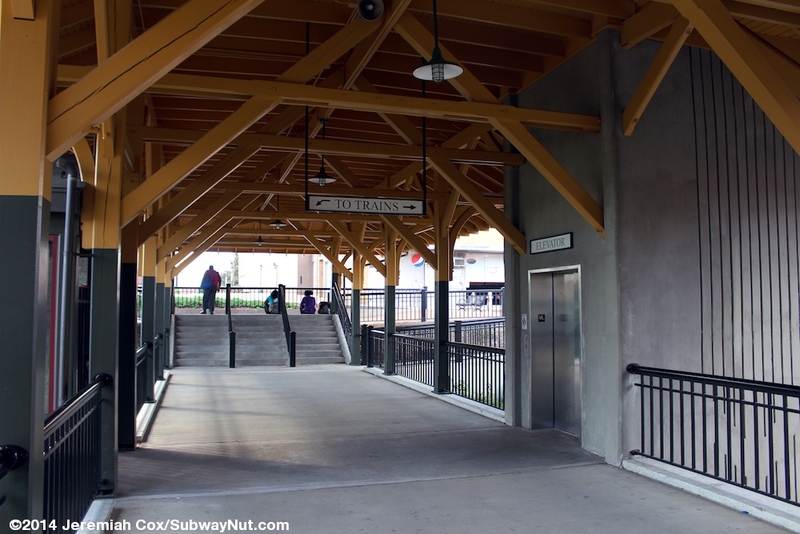 Passengers have the choice of a staircase that has a roof and is enclosed by glass windscreens or an elevator in a simple concrete shaft on each side of the overpass. Emergency access to the platform is the baggage/freight elevator and a closed staircase with a No Access sign that are across Track 1 from the platform and lead nearly directly into the station. An additional steep driveway (only closed off with a chain) leads down from Broad Avenue down a steep embankment to the tracks beneath the underpass of Elm Street. At street level canopies cover the pedestrian bridge in the same style as the station house. These lead NW towards Broad Street where a small bus loop is with a bus waiting area and plenty of shelter. 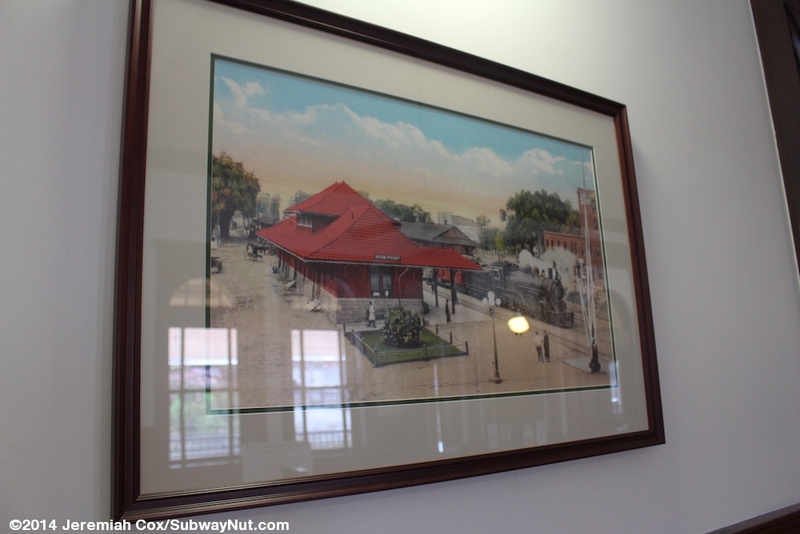 The bus waiting area has brick walls and could be a reclaimed brick building that was once probably a Railway Express Agency (a brick building is in one of the pictures inside the depot, from around when the station opened across the tracks). This is the hub and pulse-point of Hi-Tran, the local bus system. It's where regularly scheduled PART regional buses stop although Route 5 the NC Amtrak Connector stops directly outside the station on narrow High Avenue. Going SW under the shelter leads to the historic depot that is long and narrow, wedged between the tracks and narrow High Avenue. 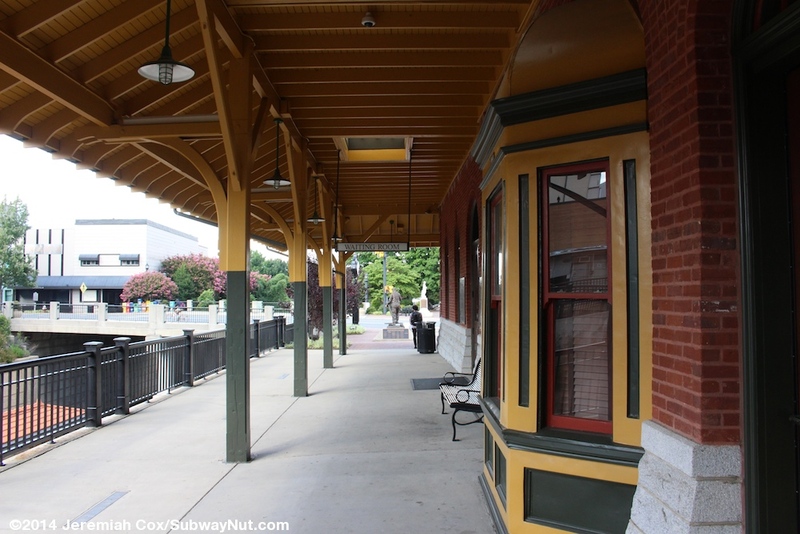 Canopies surround the roof of the depot that lead up to Main Street. 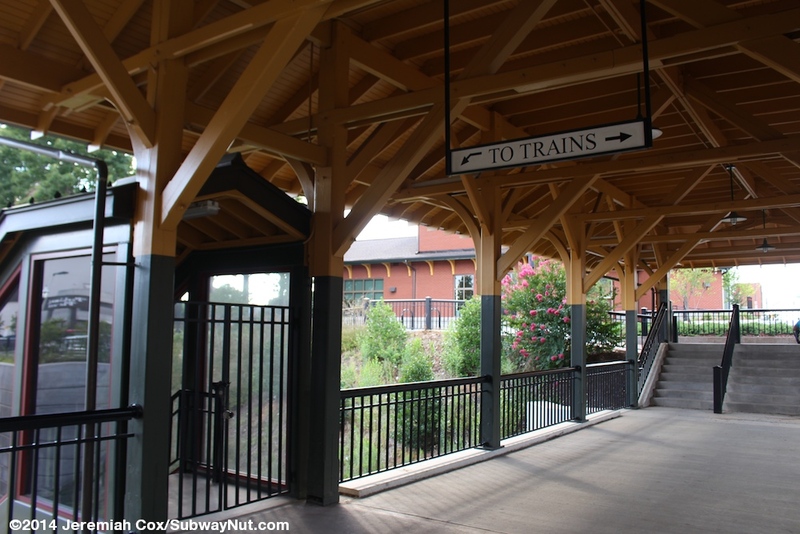 This gives passengers shelter all the way from the depot to the platforms and a wide porch is between the depot and the fence above the open-cut that's below. The building itself has brick walls and windows that are round above. Inside is a decent sized waiting area. There are two offices. 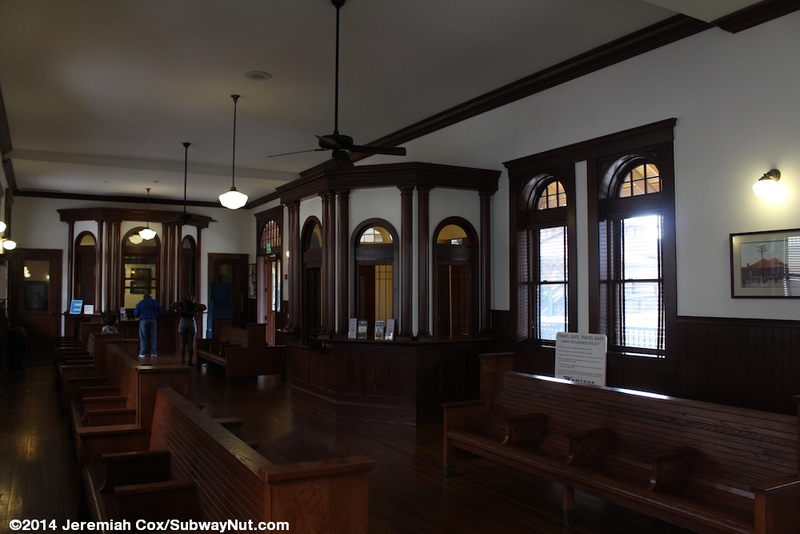 One is clearly the original ticket office since it overlooks what was originally the track area (but now the tracks are 35 feet below) and a second office in another area of the station. 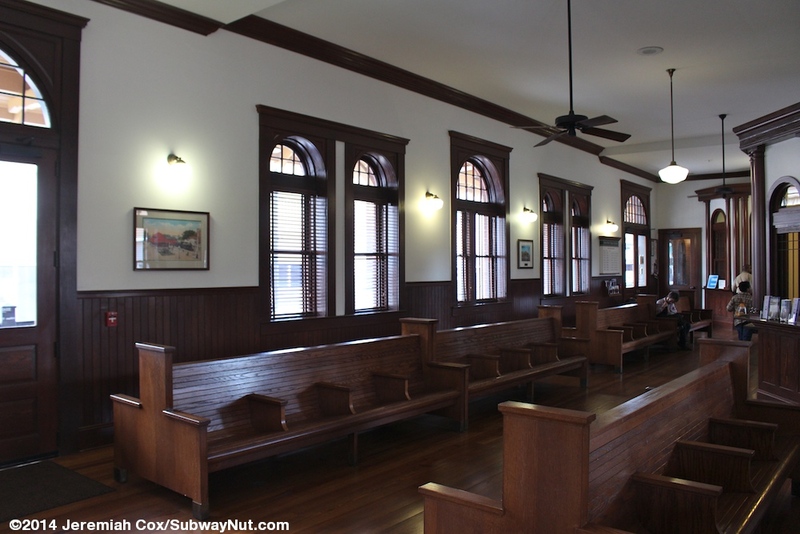 The walls inside the depot are wood paneled on white walls. Benches are in the middle of the room. Restrooms are provided along with a couple of vending machines. A few historic pictures line the walls. This website is not affiliated with North Carolina Amtrak, their official website is here. A source I have used countless times while compiling this section is Amtrak's Great American Stations as well as Timetables.org where all historical train information comes from.